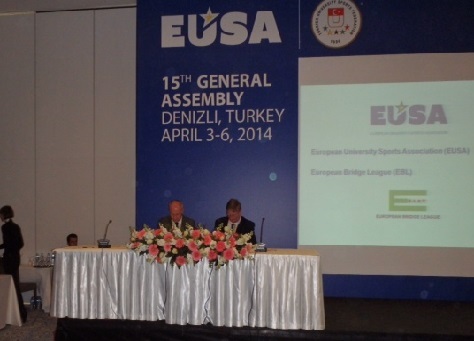 The President of the European Bridge League, Yves Aubry, attended the European Union Sports Association (EUSA) Conference and General Assembly held in Denizli, Turkey from 3rd - 6th April. Mr Aubry made a presentation ot the Conference, outlining the work of the European Bridge League and in particular its strong links with Youth Bridge, emphasising the importance the EBL attaches to this area of development. He said that the EBL would do everything possible to support the EUSA Bridge Championships, noting that these consist of EUSA Bridge Teams and Pairs Championships held in the odd numbered years and the annual online EUSA Teams Championship. He said that University activities would be promoted on the EBL Website, through mailings and also through the social networks. The President noted that Geert Magerman had been the appointed Liaison Officer representing both the EBL and WBF to EUSA for some years, and is the Technical Delegate for bridge for both EUSA and FISU. He explained the difficulties faced by the EBL to maintain a stable participation in the EUSA on-site Youth Championships, as well as to co-operate with some of the EBL NBOs. He said promotion of Bridge with some National University Sports Associations was not an easy matter and there were also problems in trying to link some NBOs with their NUSAs and to get financial subsidies from Universities. Mr Aubry considered that Bridge on Internet was a good tool for promoting bridge, especially among young people, and that it would serve the promotion of bridge in University and for EUSA, providing a qualification mechanism for EUSA Championships and Games, increasing participation in all EUSA events and involving more universities with Bridge, emphasising its sporting aspects. He expressed the view that Youth players are the key to the future of our Sport and said that Universities play an important part for the promotion and development of Bridge for Youth, confirming that EUSA and the EBU needed to strengthen their co-operation and partnership to achieve their goals. During the course of the event, Mr Aubry and EUSA signed a Memorandum of Understanding affirming the principles and nature of the co-operation between the EBL and EUSA.